What 2 things do each of these songwriters have in common? 1. Each of them wrote a body of songs that have become classics—songs that earned their writers well-deserved recognition as great artists, and made them very successful financially. 2. Each of them (and dozens of other songwriting giants) habitually used a set of amazingly effective songwriting techniques—the SongMatrix techniques—that today's songwriters know little or nothing about. Get the skills, reap the rewards: It's really that simple. As a songwriter, you almost certainly don't know what you're doing, even if you think you do. Not to worry—you're in good company: the same applies to nearly all of today's songwriters, both amateur and professional. Comparative research findings, discussed here, provide the grim evidence. Fortunately, you can overcome your songwriting skill deficiency and reap the rewards, both artistic and commercial. Every year, countless songwriters churn out millions of new original songs, nearly all of which are deservedly doomed to oblivion, not for lack of marketing and distribution opportunities, but for lack of song quality. 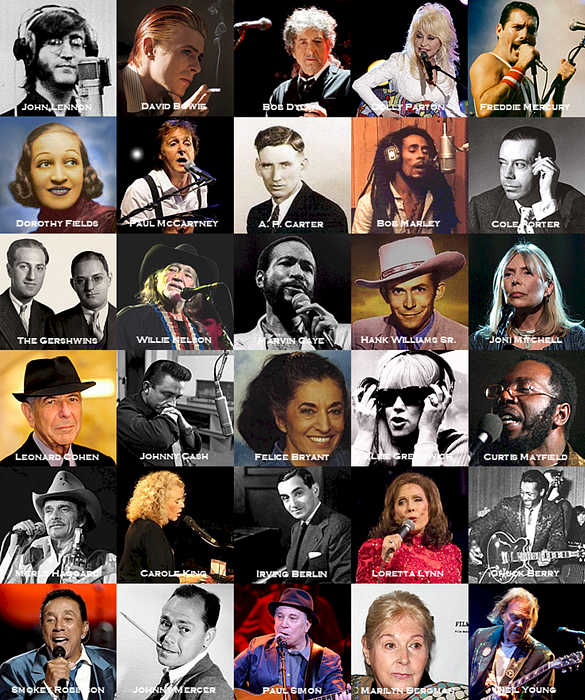 Both amateur and professional songwriters are profoundly clueless about the skills required to create timeless, genre-crossing songs, such as the songs of Lennon-McCartney, the Gershwin brothers, Joni Mitchell, Harold Arlen, David Bowie, Johnny Mercer, Smokey Robinson, Bob Dylan, and scores of others who created catalogues of classics. Most songwriters who want their songs to succeed commercially find that their songs simply fail to impress audiences beyond their own local circles. It's not for lack of innate talent on the part of songwriters. Nor is it for lack of opportunity: there are plenty of high-powered ears in the music industry waiting to hear real songwriting brilliance. The problem is the mediocre quality of the songs themselves. Nearly all of today's songwriters simply lack the technical skills to write brilliant songs. Worse, they tend to be delusional about their actual skills. They believe, falsely, that they do have the skills to write truly great songs, and have already written some. They rationalize that the reason they aren't rich and famous yet is that they haven't produced the right kind of demo, or haven't been able to pitch their songs to the right people in Nashville or Los Angeles or New York or London, or some other such excuse. How you measure, quantitatively, the quality of your work, then revise accordingly. As Lord Kelvin observed, "If you cannot measure it, you cannot improve it." If you're serious about songwriting, you will find SongMatrix indispensable: SongMatrix enables you to quantitatively evaluate or "audition" your original songs—to check the quality of your original songs, revise them to improve their quality, measure them again, and repeat, until the quality is genuinely brilliant—before you introduce your songs to the world. SongMatrix is a weighted matrix of 44 advantageous songwriting techniques, which, when applied as you write your songs, spell the difference between songwriting greatness and songwriting mediocrity. In its current iteration, Version 4.1, a total of 26 SongMatrix techniques relate to music and 18 to lyrics. The exact techniques and how to apply them in your songwriting are taught in the SongMatrix course, and set out in detail in the SongMatrix book. Hardly any of today's songwriters know how these techniques work and the relative importance of each one with respect to the others. This applies not only to songwriters who use the traditional guitar-and-vocal or keyboard-and-vocal approach when writing songs, but also— especially—to those who adopt processes such as the "top line over instrumental tracks" method of committee-written, manufactured songwriting aimed at contemporary hit radio. By contrast, SongMatrix focuses on high-quality songwriting rooted in the triggering of various evolutionary adaptations of the human brain that become activated when a listener hears an "adaptation-friendly" song. Usually an audience will applaud simply out of habit, politeness, or duty—the performer finishes the song; the audience dutifully applauds (because that's what an audience is expected to do), regardless of the quality of the song. Sometimes they applaud enthusiastically because a solo performer or band demonstrates obviously well-developed instrumental or vocal skills, which shine through, despite the mediocrity of the songs. Sometimes they applaud because, being your friends or relatives, they feel obligated to encourage you. Sometimes they applaud out of relief that your long boring or confusing original song has finally come to an end. Sometimes they applaud because, in some circumstances, any live act contributes to a party atmosphere, with everybody tossing back drinks and having a good time—conditions that would generate applause for any musician playing anything. Whatever the reason, such encouragement creates a positive feedback loop: it inspires bands and singer-songwriters who perform second-rate original material to keep working at their songwriting craft, to keep on composing, recording, and performing their second-rate songs, in the mistaken belief that their songs are getting better, are worthy of larger audiences, and will lead to professional songwriting success. It doesn't happen, and the problem is the mediocre quality of the songs themselves. Songwriters who know what they're doing are rare today, even though brilliant songs are more valuable now than they've ever been. Fifty years from now, unless things change, it's likely that only a handful of songwriters will have written a sufficient number of classics to be considered great songwriters. What brought on the decline in songwriting skills? Prior to about 1980 (plus or minus perhaps five years), record companies and music publishers tended to employ musically-savvy gatekeepers. The high cost of developing recording artists necessitated finding the best possible songs. Starting in the 1980s, as digital technology drove down the cost of recording, many musicians with adequate instrumental and vocal proficiency but mediocre songwriting skills realized it was possible to sidestep the industry gatekeepers and independently release their own recorded product. By the 1990s, the world was flooded with independent recordings of second-rate original material by unknown bands and songwriters. The rise of accessible online music distribution websites, followed by YouTube in 2005, further lowered the bar. Today, literally anyone who calls himself or herself a songwriter and has a few hundred dollars to spare can make studio-quality recordings and music videos, and distribute them on a plethora of platforms. However, few performing songwriters realize that, although they may have good or even great performing skills, they have mediocre songwriting abilities (to put it mildly), and their songs show it. All of the above bring in large crowds of paying customers and sell countless millions of downloads, CDs, and concert tickets, while glossing over the fact that the actual songs that pop stars perform and record (songs that are almost always manufactured by production teams)—including most Grammy-winning songs—are truly mediocre. The songs that pop stars turn into hits are no better in quality than any of the thousands of average songs that average bands and average singer-songwriters upload to YouTube every day. Declining sales of recorded product have made the music industry even more risk-averse than it used to be. Today, the industry will continue to back any artist with a hit record in order to maintain sales levels over time in any and all available platforms. They will try to create more hits with the same artist, regardless of the sameness and mediocrity of the committee-written songs, rather than take risks with new artists. Major labels tend to go to the same production teams to manufacture same-sounding songs for performers with track records of hits. Thanks to the power of social media, the bandwagon effect influences hit-song staying power more than ever. Meanwhile, the world awaits the re-emergence of skilled songwriters. © and  1987 - 2017 Roedy Black Publishing Inc. All rights reserved.